Home » Posts Tagged "Schooling"
Around the year 2000, I moved to the UK and began navigating down the open and unchartered waters of my post-graduate degree (it being a self-created research project). A few months into the degree programme, I dove deeply into a great sea of literature that engaged with critiques of education and international development. During this phase of literary free-diving, many new worlds of thinking, acting and living began to open for me. I found it simultaneously thrilling and disorientating. 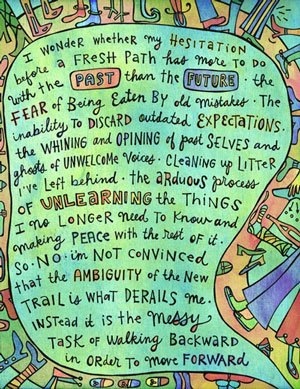 Yet, the direction it has led me to, this journey of enlivened learning we are on now, feels exactly right. Since that time in the early days of living in the UK, I have often encountered three terms that are expressed in overlapping ways – de-colonization, unlearning and de-professionalization. It has taken me a long time to understand what these mean and I am still learning, particularly along this journey we are on now. I feel that I can grasp the logic of these terms, intellectually, but it has taken me much longer to be able to grasp what it might mean to experience them. These last several months, I have noticed many, many different things that are causing me to pause and reflect on how my mind and body have been conditioned and colonized through my education and social upbringing. As Udi finishes a series of posts on Brazil, I am going to finish a series of posts that explore de-colonization, unlearning and de-professionalization, as I have not only come to understand them, but as I have come to experience them more fully along this journey. 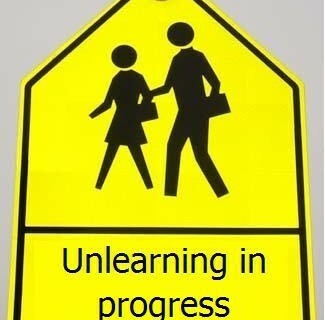 The pictures you will see in this post I have taken straight from the internet – images that come from googling ‘unlearning’. I thought this would be an interesting way to represent how others have represented what this term means through imagery. I will put in my own images in future postings on this topic. 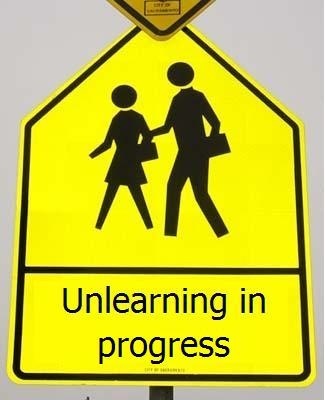 This post here is a beginning – that I hope will help to open a series of windows to reflect on how, during our enlivened learning journey, I am unlearning and relearning much of what I was educated to believe, to think, to do and to live — how I am ‘deprofessionalizing’ myself, and how I find that I am becoming increasingly ‘de-professionalized’. First, a little bit on colonization…. The words ‘colonized’ and ‘colonization’ are often reserved for, and orientated towards, different indigenous and minority ethnic groups. During my own schooling, for example, the word colonization was used in ways that referred to the taking over of people, communities (most often indigenous or other minority groups) and land by another outside, foreign force. In other words, we (sort of) learned about the physical aspects of colonization. I say sort of here because our learning exploration on colonization, even as a physical force, was very limited and almost entirely one-sided. Being taken over by physical force is violent – where the perpetrator and the victim experience violence. During school, I do not remember any point in time when we critically considered the colonization processes, the unjust forms of violence, that Native Americans endured (and continue to endure today). It was something of an inevitable fact that was going to happen, that was meant to happen. 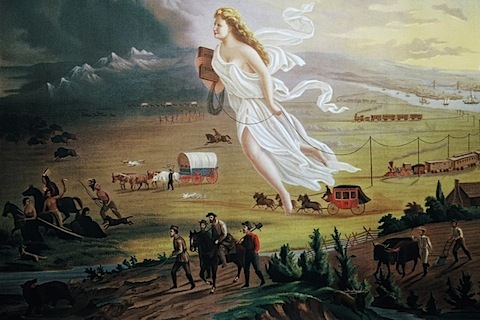 It was always downplayed, minimized and cushioned into a formation of knowledge that somehow (implicitly) validated and legitimized the violent taking over, the colonization, of all of the United States of America and the genocidal impacts on the many hundreds of indigenous communities that once covered these lands – that emerged from these lands. The many forms of violence, associated with colonization, that I have learnt so much more about on this journey, is incomprehensible. Since my initial literary free-diving phase when I first came to the UK, I have come to perceive and understand colonization, and the processes of colonization, as not only something that is physical. I now see colonization as mental, emotional, cultural, spiritual, ecological… I also understand colonization as long-lasting, inter-generational – and continuously masked in new forms (I will discuss this more later – but an example of this is the ‘Empire of Money’ phase that the Zapatistas describe and I discussed in a previous post). Each of the educational initiatives we are visiting along our journey are directly facing previous and continued forms of violence associated with colonization — but, significantly, aside from just facing them, they are creating ways to move beyond them. This aspect to me – this moving beyond is what is most important. What moving beyond does is to not only perceive places, other people and ourselves as in deficit, but instead focus on possibility, healing, compassion, community, creativity and imagination. I feel this moving beyond is what we can all learn from, no matter our own background, cultural context, social and educational upbringing. For any of us to move beyond, from what I understand, we must go through de-colonization processes of unlearning and re-learning much of what we have been taught. My own process of de-colonization is about going to the core of my own assumptions of what I think is true or ‘right’ — for example, about the stories through which I was taught in school (particularly with reference to ‘history’ that is often incredibly one-sided and narrow) and all sorts of aspects of my life, or how I have chosen and will continue to choose to live my life (what is important to me and what I value), particularly my so-called ‘professional’ life. All of us have to learn to ‘be professional’ to be absorbed into any working system. To get to the point that I was working as a lecturer in academia, I had to unsurprisingly jump through all sorts of professional hoops. Within the walls of the university, I have often sat through long departmental meetings and reflected on the communication structures that are in place during those hours – how we communicate, the words and the tones that we use, who dictates the flow of communication, the minute and mundane details – typically around illogical administrative expectations – that occupy hours of discussion, the context of where we are actually sitting (inside plain, institutional walls). The air is stale. There is no fresh breath of creative life during these hours. Yet, this is the essence of professionalism. The conduct and criteria carried out during these meetings. My quest to de-professionalize my so-called professionalized self came long before leaving the institutional halls of academia. I have always pushed boundaries, this is part of who I am, and I am highly sensitive to structures of power and authority. I am sure my parents have much to say on this topic! My sensitivity to power also led me to my post-graduate studies which were essentially a critical exploration of power structures within the education and international development fields. How we each experience and ‘exercise’ power – on each other and on ourselves — and why we do so as well as the effects this (can) has – have been burning questions and interests that have consumed many hours of my life. I use the term ‘exercise’ here as I feel that we all are constantly receiving and exercising power. It is what makes us human. Explorations of power are not only an intellectual exercise for me — in fact, it has been a passion of ethical, moral and even spiritual belief. There is much about leaving my academic work in the UK and embarking on this journey that is to do with ‘de-professionalizing’ myself, to somehow disconnect with the hierarchical structural centre of academia, whilst still staying connected at the margins. I want to disentangle myself from the constraints of rationalism that comes through forms of institutional power and authority that I experienced during my time in studying and working in academia. I want to unlearn the hierarchies of power and legitimacy, particularly around leadership, knowledge and relating, I feel that I placed on myself to be able to survive within the institutionalized system. I want to experience and learn more about how generosity and hospitality can be a central priority (how it can be offered) that has often been devoid within the academic system. I want my learning to be transformational, not imposed. Education either functions as an instrument which is used to facilitate integration of the young generation into the logic of the present system and bring about conformity or it becomes the practice of freedom, the means by which men and women deal critically and creatively with reality and discover how to participate in the transformation of their world. In the academic environment, as in many institutional working environments, leadership decisions, ways of relating and professional conduct most often take rational forms for efficiency and accountability. And, being rational tends to be driven mostly, if not almost entirely, by ourheads. 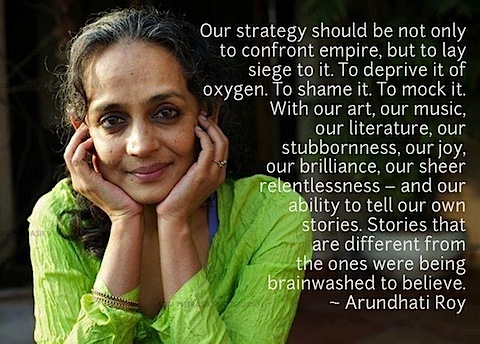 In other words, our hearts tend to be marginalized, if not silenced. Rather than working only through our heads (as is the dominant form of learning in the educational system, including academia), Udi and I have both struggled to continue allowing our hearts to lead our work, our ideas, our relationships – with students and staff within and outside the walls of the university. As the university becomes increasingly bureaucratized and corporatized, there is very little space for anything beyond teaching-learning relationships that are based on efficiency. Thus, teaching-learning relationships that are based on co-creativity, generosity, curiosity, hospitality are becoming increasingly rare. When we each learn through and make decisions with our hearts (rather than only our heads), there is more life. What I have experienced in each of the places we have visited over these last 7 months – is that learning, relating and leading is prioritized as much with the heart, the hands and the home —- as the head. This is because learning is about connecting first and foremost – connecting between theory and practice, connecting to a deep sense of self with community and the land and all of its beings. It is a somewhat brave step for me (part of the de-professionalizing process I think) to open up personally on this topic. I feel slightly timid, like I am about to jump into cold water. I know the water will be refreshing and rejuvenating, but it is still somehow intimidating. 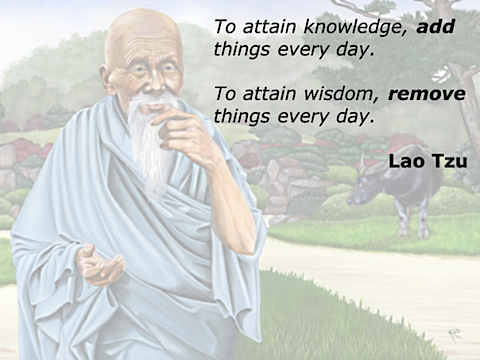 However, I feel it is important for my own un-learning. If you are still reading at this stage, thank you! I’d love to hear comments and feedback — and even more, to hear about your own experiences of resistance in your professional life, or your own un-learning, de-colonizing or de-professionalizing processes! Through Grimaldo Rengifo’s connection in Lima with Pratec, we met Elena Pardo in Cusco. Elena is a warm, committed and generous person. After two long conversations, she invited us to attend a Quechua ceremony at the winter solstice (December 20) in the ruins of Saqsaywaman above Cusco, an amazing and unforgettable experience. Knowing we would be in Chile in late February, Elena also invited us to join her in a visit to a Mapuche school she has been in contact for a number of years. Actually her invitation was even more enticing, to join her at a ceremony with some Mapuche people by the Lago Arco Iris (rainbow lake) near the Icalma volcano! Needless to say we were excited about this and faithful to our principle of being open to what arises we took the thirty-hour bus ride from Buenos Aires across the border to Temuco, Chile, about 8 or so hours south from Santiago. We will write about our learning and experiences of ceremony later, but this was a moving event and spiritual exchange between Quechua and Mapuche Elders. In our third day in Chile we were invited by Elena’s friend Don Roberto, who was also at the ceremony, to visit Trañi Trañi, a Mapuche intercultural school a few kilometres outside Temuco and be part of two days of meetings with Elena, teachers, parents and students before the school year begun. The school has around 90 students from the surrounding communities and 14 teachers, some Mapuche, a number of whom we met at the ceremony a few days before. 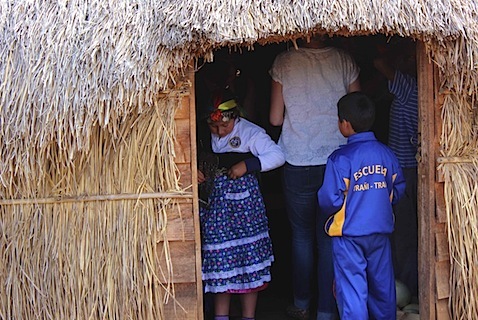 Mapuche language, history and culture is taught at the traditional ruca building made of mud and straw which sits by the rest of the school’s buildings. The other buildings are also designed so as not to have corners and the desks are positioned in clusters so that the authority of teacher is not emphasised as in traditional classrooms. 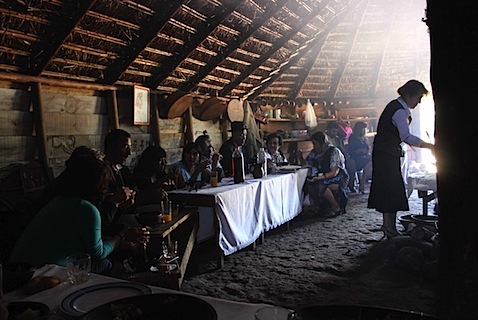 The meetings took place in the ruca and we were treated to a warm and overwhelmingly generous Mapuche hospitality. Around fifty of us from young students to the village elder sat in a circle and greeted each other with hugs and a single kiss on the cheek. When latecomers arrived they also went around the whole circle doing the same. Everyone spoke and introduced themselves. We were left with a warm, affectionate glow and a deep connection to all in the room. A far cry from the often inhospitable conferences, seminars and staff meetings we are used to! 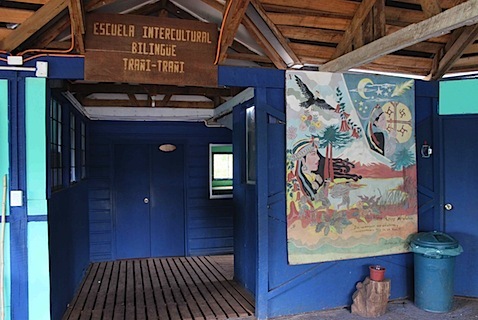 Trañi Trañi, which has been around for over a decade, is considered a model intercultural school in the region. In the south of Chile where most of the Mapuche live and make up a considerable percentage of the population and ownership of land there are around two hundred such intercultural schools. These are a new phenomena only beginning to emerge after the Pinochet era (from 1973 to 1990) and hundreds of years of cultural oppression. Such intercultural schools are beginning to emerge all over the Americas. We visited the wonderful school in the Blood Reserve in Alberta where Kelly ran with teachers and students in the annual race across the prairies. We visited another school in Lamas within the Quechua Lama community, also going on a school trip to the forest with the students, teachers and a local elder who knew the forest. Across these schools and the hundreds or thousands of others like it in the continent there is a constant tension between teaching the national curriculum and the incorporation of local ways of knowing, doing, being. National curriculums tend to offer learning that is completely divorced from indigenous language, culture and history, suppressing these in favor of a Euro-centric national identity. The commitment to and desire for a truly intercultural education on the part of teachers, students and parents also varied. It takes remarkable individuals, people like those we referred to here, masters of two cultures to really inspire others of the importance of interculturalidad. We saw how rare or transient were the spaces for learning about or sharing the competencies of being intercultural. We came across some wonderful experiences for training teachers such as the course in Blackfoot Ways of Knowing run by Narcisse Blood and Cynthia Chambers (professor of education) at the University of Lethbridge in Alberta. (see the posts we have written on this here and here). Elena also organised a course along similar principles at the University of Cusco for teachers, based on Quechua ways of knowing. These initiatives deeply impacted the teachers who took the course opening their lives to inhabiting this space in-between. But both these courses only ran once and were not made regular by these universities. As both Cynthia and Elena related to me, there is a deep resistance of the traditional university to accommodating other ways of knowing. At Red Crow Community College the Kainai Studies course (one of the most advanced course on indigenous ways of knowing we have visited) the inspiring effects of the course on a number of students from the College we talked to were clear to see. Many spoke of rediscovering their history, their identity, of reconnecting with their ancestors, with grandparents, their land, and most importantly with a sense of pride and value of a way of life that had been oppressed for many decades. But the course has also been taken by non-Blackfoot, people who came to find a renewed connection and responsibility to the place they live in. In the course of these seven months of traveling and learning from these different initiatives I have become convinced that we are all going to have to learn to be intercultural. We will learn to inhabit a cultural space between the ways we have been educated to see and be in the world within our industrial societies and other ways of relating to place and community, many of which have existed for thousands of years. These other ways may not necessarily be entirely Native or indigenous cultural practices, although we can learn much from them. But wherever they come from, in building sustainable societies we will need to master practices, other principles and values that reconnect us to place, each other and ourselves. Across our travels in Latin America, we came across a wonderful word and practice, interculturalidad (the process of being intercultural). The term is common in Latin America amongst those engaged in educational initiatives that try to include, or bring together, different cultural knowledges and ways of living. Currently, attempts to integrate interculturidad learning involves combining two very different cultural worldviews – most often those originating in Europe and found in “settler” or so-called ‘modern’ societies and those that originate in diverse, particularly indigenous cultures across the Americas. I can only begin to imagine what it might be like to have to learn and master two dramatically different languages, ways of seeing and being in the world, sets of values and forms of conduct. I have gained a kind of competence in these two places, Rio and the UK, navigating through day-to-day life in each place in the way a local might. But these ways of knowing, being, relating, at least within the circles I was raised, are not so very different in their underpinning cosmovision, their fundamental way of seeing and being in the world. This is not such a leap of interculturidad as say between Blackfoot and North European culture that settled and colonized North America, or Quechua and South European culture that settled and colonized South America. Amongst our journey we have been lucky to have met individuals who are masters of considerably distinct cultures. People who have been living amidst this European-derived settler/colonizing culture and who have also deeply studied these ways of knowing and being in the world, often at a university level. At the same time they have not been completely seduced by this way of seeing/being in the world and have also a deep knowledge and identification with the ways of their indigenous ancestors. These individuals live their lives in this in-between space of interculturidad and many are also deeply committed to teaching others how to inhabit this space. We saw the mastery of two distinct cultures in the re-emergence of Blackfoot Ways of Knowing at Red Crow Community College in Alberta, Canada, with Ryan Heavyhead, Duane Mistaken Chief, Narcisse Blood, Alvine Mountainhorse, Ramona Bighead and Cynthia Chambers. In the field of art we experienced the mastery of two worlds at the Freda Diesing School of Art in Northern British Columbia with Dempsey Bob and other First Nations teachers such as Stan Bevan, Ken McNeil and Dean Heron. We witnessed this in the comunalidad work of Zapotec anthropologist and activist Jaime Luna in the hills surrounding the city of Oaxaca in Mexico. In Peru doing inspiring and courageous work in this sphere of interculturidad were all of those we met as part of the Pratec network (in Lima, Lamas and Cusco although there are many other Pratec organisations in other parts of the country). Elena Pardo has not only mastered two cultures, she has developed interculturidad education that has influenced all of Pratec. Elena had worked for many years in the Ministry of Education before leaving and founding her own organisation CEPROSI (the Centro de Promocion y Salud Integral), part of the PRATEC (Projecto Andino Tecnologias Campesinas) network, which is active in the promotion and support of Quechua cultural knowledge and practices in agriculture, schools and in the field of health. 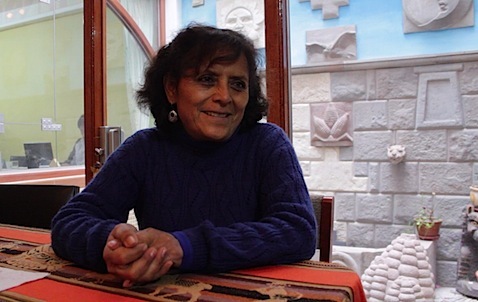 Her work focuses especially on the food, ceremony and spirituality of the Quechua peoples in and around Cuzco, trying to integrate these fully into schools beyond the mere tokenistic approach that is most often taken. Pratec generally aims to support and strengthen genuine interculturidad and we learned much about this when speaking with Grimaldo in Lima and then spending nearly a week in Lamas, at Waman Wasi. 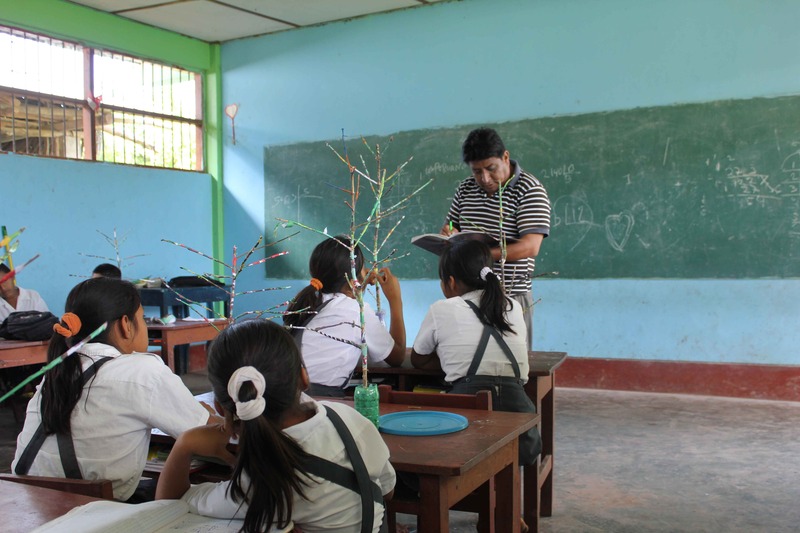 During the days we spent visiting the work of Waman Wasi, in the upper Amazon region of Lamas, we visited different villages and schools, and school trips, accompanied by either Leonardo or Gregorio who had been working at Waman Wasi for a number of years. One day we went to a Quechua Lama village a few kilometres away from Lamas to visit a school Wama Wasi had been working with. We were met there by a lively non-Quechua Lama teacher who was engaging and well-liked by the students. It was just before Christmas and the students, ranging in age between 10 – 12 had been making Christmas trees from paper and branches when we arrived. 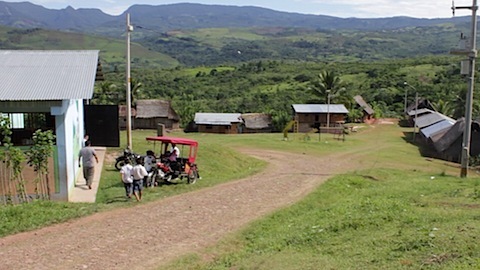 This teacher had been working with Waman Wasi for some time and was open to incorporating the videos they produced on local knowledge and cultural practices into his own teaching. 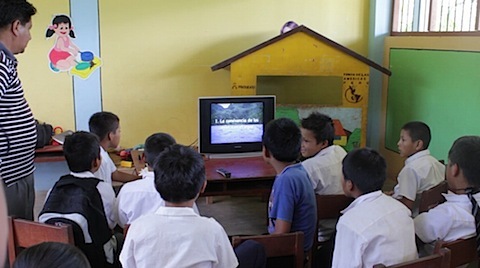 We observed the class watching a video Waman Wasi made with another group of children on fishing and river pollution at another Quechua Lama village. The activity of watching the video, which the school-children had to write about later, was part of the days’ curriculum which was all about the environment. Though the days’ teaching activities went well and the students seem to have enjoyed it we were both surprised to hear that the teacher, like many others in this region, did not speak Quechua Lama even though he had been teaching in the same village for many years. Thinking back to the school trip to El Monte, to our conversations with Leonardo, Gregorio and Elena Pardo in Cusco, we saw how important it was to have teachers that are committed to interculturidad education. 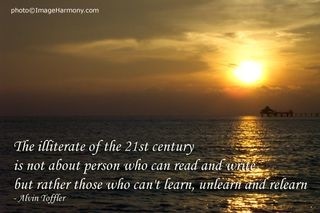 Committed to being, learning and teaching between cultures.